OK, a tip for all business owners out there: if someone orders a product from you, and you don’t have it, tell them that. Or at least respond to your email, or answer your phone. Ellie likes her new kennel. These are the things that didn’t happen when we ordered the airline and Aussie-approved ultra-secure carriers for the kitties, from the company that Air Canada recommends. After waiting several weeks, far beyond the expected delivery date, we tried contacting them. No replies to emails, no answering of phone. Finally got through, and they said there was a problem with the supplier, and they didn’t expect any for a few weeks. Well, you could have told us that…it’s not like we were just ordering these things for fun. Moving these cats is a costly venture, but the more important thing is that all the detailed instructions are followed to a T – anything done wrong could result in our little guys going into quarantine for 6 months! So having the proper carriers is crucial. Lester likes his new kennel, including the special mat from DryFur that will account for any "accidents" mid-flight. We eventually found a company in the southern US that sells good carriers, and they sent them by courier on Good Friday (what? doing business on a holy day south of the Mason-Dixon…capitalism beat out religion!) and they were here within a week. We now have these monstrous kennels (for the record, Sky Kennel #200 medium size) in the living room, letting the kitties get used to them. Lisa, ever the good librarian, also informed our animal removal company of the problem with Air Canada’s supplier, as well as the name of the US company, so that they could inform other clients. We’ve yet to receive a finder’s fee, but we’re hoping… Lisa also found a company that specializes in making kitties comfortable on long journeys – DryFur. Malachi would rather go in the box, but Air Canada probably won't allow it. The cats obviously don’t know what is happening, but we think they do sense that something is up. They are acting a bit weird lately. It might be that they are freaked out by the number of people coming to the door to buy our stuff. Or it might be that we have sold so much of their favorite stuff. All three of them loved to hang out on the bar stools in our kitchen; someone bought those. All three of them loved to sleep on the old ratty couch in our basement; someone got that for free. Lester and Malachi spent a lot of time on the futon in our office/spare bedroom. A friend took that away last week. They like to chew on plants…those have now turned our friends’ loft into a jungle (thanks W & P!). Lester almost went with the futon to its new home...he wasn't going to let go. We think that we have to get rid of the tree/scratching posts that they use constantly, scratching, fighting, watching birds, sleeping. But we have to figure out how to do it: what’s the strategy to list them on kijiji early enough to ensure they get bought, but not too early that we have to live without them? It’s a conundrum. The move itself is going to screw with their world enough that we want to keep them happy for as long as possible before they leave. 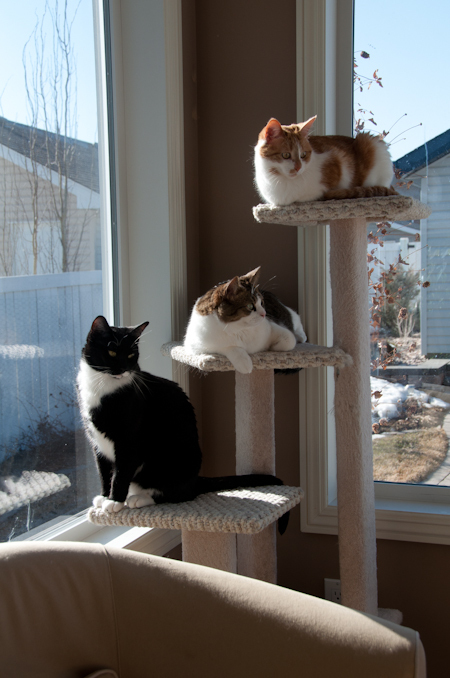 All three cats staged a protest to prevent us from selling their tree. The rest of the cat moving process is very up in the air. Air Canada doesn’t allow you to book an animal into cargo more than 30 days ahead. We have made plans with the pet relocation company to pick them up on July 4. They will fly to Vancouver that day, stay overnight in a facility there, be inspected, locked into their kennels and shipped to Sydney on July 5. The only glitch would be if there were a lot of other animals traveling that day, and there wasn’t room for them. It probably won’t happen, but we are keeping our fingers crossed just in case there is an international pet show in Australia and people are shipping their show animals that night. We will be on the same plane from Vancouver to Sydney. We won’t be near the cats – they will be in cargo, we will be in economy. They will probably be more comfortable than us. They won’t know we are there (although Ruthy, our pet relocation expert, assures us that they will know and that they will appreciate our psychic presence! ), but we will know that they are with us. If the plane goes down somewhere over the Pacific we can make a spoof of Lost starring our cats and whatever other animals are on the plane. How will it end? Dan won’t know… he refused to watch the show. We won’t get to spend much time with the kitties in the near future. They will be spending a lot of time at ‘camp’, the wonderful Calico Hills Kitty Lodge where they go when we are away. We are going to be in Ontario for almost 2 weeks in May, so they will be at camp. Then they go back to camp the first weekend of June, because our house will be getting packed and loaded June 6th to 8th. Cats + boxes = a bad combination; they’d end up getting packed away by mistake. Then, we go to the UK for 3 weeks before we move to Oz (talk about bad timing!). So the cats are having an extended trip to summer camp. When the cat removalist picks them up at Calico Hills on July 4, we will be there to see them off. We expect tears (Lisa and Kelly, their ‘camp mommy’, who loves them like they were her own! Will Dan cry? Watch this space for an update). When they land in Sydney, someone picks them up and takes them to the Eastern Creek Animal Quarantine facility; we board a plane to Wagga without getting to see them. Expect more tears… well, just from the jetlag. And we’re very pleased that our good friends in Sydney will be able to visit the kitties during their imprisonment (thanks M & H!). We then have to find rental accommodations that are cat friendly and count the days until they get shipped from Sydney to Wagga (expected “release date” is August 6). Fortunately, cats don’t understand time and things will be back to normal very quickly. Lester will be thrilled to see us, Malachi will be his normal aloof self, and Ellie will be as bitchy as ever. This entry was posted in cats, Moving, quarantine. Bookmark the permalink. I suspect that this is all a cunning plan. When I visit them at Eastern Creek, they will all immediately go “Oh no, its the evil SOB who locked us all in the laundry!” and immediately blame me for their incarceration in Kitty Gitmo. I will have to have Harriet give them their new toys, in case they think theyre drugged! Then when they see you two again, they will see you as their resuer from the evil laundry tyrant.